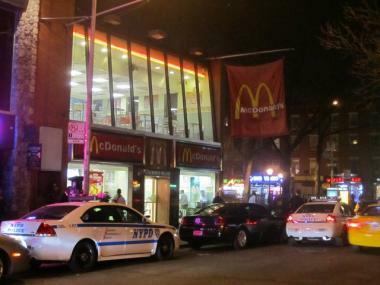 The West 3rd Street McDonald's was the site of violent incidents in May 2011, October 2011 and March 2012. GREENWICH VILLAGE — The West 3rd Street McDonald's that has been the site of three violent incidents in the last year should adopt security tactics similar to those used in bars to keep the fast-food joint under control, police said Wednesday. Following a call Monday by City Council Speaker Christine Quinn to boycott the Village McDonald's until its management hires off-duty NYPD cops, the commanding officer of the Sixth Precinct said police gave franchise owner Carmen Paulino tips during a Wednesday meeting on how to control the restaurant and sidewalk outside. "What we're trying to convince McDonald's to do, and what I think they've been receptive to, is treating their McDonald's as if it were a bar past a certain hour of the night," Sixth Precinct Deputy Inspector Brandon del Pozo said. "What they're getting is every negative aspect of having to deal with policing a bar without the high profit margin of actually selling alcohol." 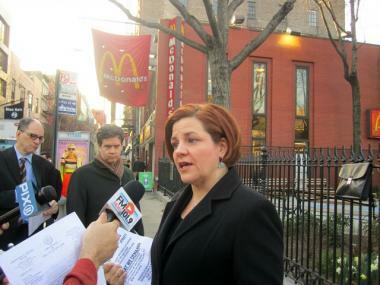 City Council Speaker Christine Quinn held a press conference outside a Greenwich Village McDonald's March 26, 2012 asking for people to boycott the restaurant until it brings its security under control. Tactics on the table include giving police direct Internet access to restaurant security cameras, walling off seating at night so customers can't linger in the restaurant, and hiring NYPD detail officers to police the premises, del Pozo said. A video shot on St. Patrick's Day and posted on YouTube shows a large fight on the sidewalk outside the restaurant involving young men who were seen tackling and kicking each other. Police received emergency calls reporting a large fight, which occurred about 11:30 p.m., as well as follow-up calls saying the combatants had dispersed, del Pozo said. Everyone left the scene by the time police arrived, he noted. No one is being sought by police in connection to the fight because no assault claims have been filed and officers need to observe disorderly conduct in order to issue violations, del Pozo added. Paulino said in a statement Thursday that the meeting with del Pozo and representatives from Community Board 2 and the offices of Quinn, Manhattan Borough President Scott Stringer and Assemblywoman Deborah Glick, was "very productive." "As part of the West Village community, I appreciate the opportunity to be part of the ongoing discussions to ensure the safety of residents and guests," she said. "We discussed numerous ways we can work together to ensure the ongoing safety of the community." The St. Patrick's Day brawl followed two previous instances of violence. Last October, McDonald's worker Rayon McIntosh was caught on video, first reported by DNAinfo, using a metal rod to beat two women who had jumped over the counter to attack him. McIntosh was initially charged with assault and weapons possession, but a grand jury cleared him after finding he had acted in self-defense. The two women have since been indicted on unrelated burglary charges. Last March, Damian Furtch, 26, suffered facial injuries in an apparent gay-bashing incident outside the restaurant. Police arrested a 21-year-old man for the attack, but he was not charged with a hate crime.